Scripting: Converting Hexadecimal string to Decimal number? Any suggestions as to how to do this? Hex, or hexadecimal, is a number system of base 16, using the first 10 digits (0,1,2....9) and the first 6 letters of the English alphabet. 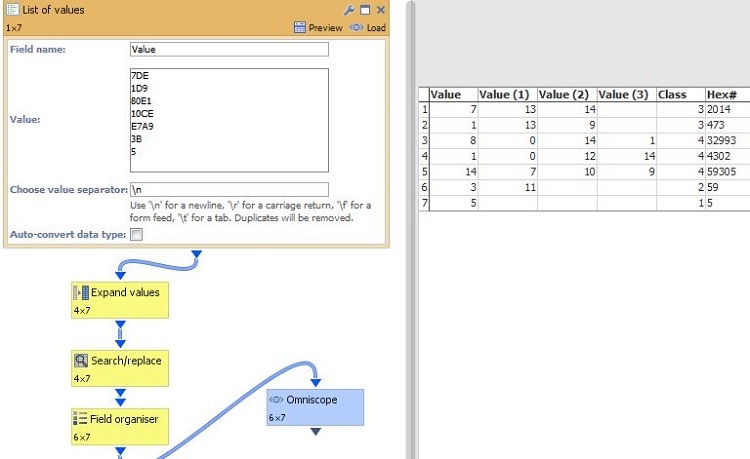 You can perform Hex -> decimal conversion by using Omniscope operations - Expand values, Search/Replace and formulas. Please see attached file that you can use as a template, replacing the original data source with your own. Where "Hex" is the field which contains hex value (Example attached).